I joined J W Hughes & Co in August 2015 initially as a Paralegal. 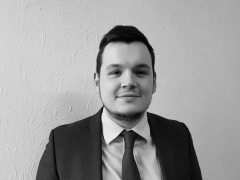 I commenced my Training Contract with the firm in June 2016 and qualified as a Solicitor in January 2018. I have a particular interest in non-contentious matters which include Residential and Commercial Conveyancing, Wills, Lasting Powers of Attorney and the Administration of Estates. I also assist in our Family department, most notably with cases involving Private and Public Law children matters. I have experience of dealing with matters in Small Claims Court in relation to Debt. I began my training at the University of Law (previously the College of Law) in Chester, where I completed the first undergraduate 2 year law degree. I continued my studies at the same University after graduating, completing the Legal Practice Course in June 2015. I speak fluent English & Welsh. I am primarily based at the firm’s Conwy office but I am able to attend clients at both offices or if more suitable at their homes or other place of business.